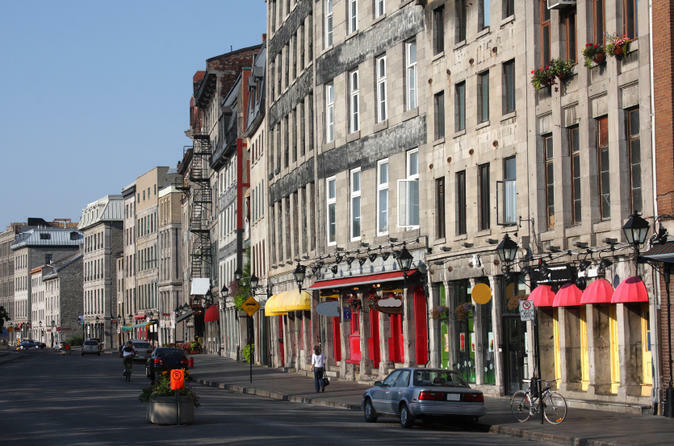 Experience the history and progression of Old Montreal on this 1.5-hour walking tour. Follow a guide into off-the-path courtyards and see where the city started in the almost forgotten Place Royale. Stroll through the bustling squares of Place Jacques-Cartier and Place d’Armes, and pass by renovated historic warehouses in Old Port and on rue de la Commune, home to swanky restaurants and tech start-ups. On this tour, see the best of both east and west Old Montreal. Meet your knowledgeable guide at a central café in Old Montreal for your 1.5-hour walking tour that combines top attractions located in both eastern and western Old Montreal. Stroll through the cobbled square of Place Jacques-Cartier, lined with cafes and street performers, and learn about the 1809 monument commemorating Lord Nelson's defeat of Napoléon Bonaparte at Trafalgar. Carry on to Place d’Armes, where you’ll find the Gothic Revival architecture of Notre-Dame Basilica of Montreal, inaugurated in 1829. Discover the grand buildings of finance on Saint-Jacques Street, Montreal’s version of Wall Street, and as you pass the restored historic warehouses along Saint Paul Street, hear about this former center of fur trade. Visit Place Royale, a picturesque and quiet square, where you’ll see Pointe-à-Callière, Montréal Museum of Archaeology and History, built on top of actual remains of the city’s birthplace. Explore Notre-Dame Street, rue de la Commune, and discover hidden courtyards. In Old Port, walk along a historic riverfront of maritime facilities, museums, shops and cafes. Your tour ends at the departure point.